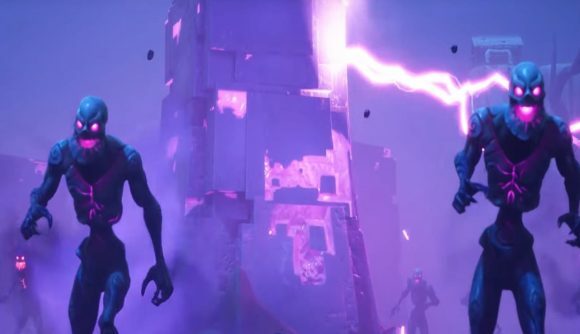 Fortnite added a host of AI enemies to battle royale this week, and those zombies – sorry, ‘Cube Monsters’ – have been playing a significant role in the outcome of pre-Halloween matches. Perhaps too significant. Epic has heard those complaints, and the studio has cut back on the number of undead monsters you’ll see in the mid and late game. On Reddit, Epic has broken down specific numbers of spawners at each phase. Phase one still has 85 spawners, while phase two drops from 40 to 25 and phase three drops from 30 to 15. Phase four lowers from ten to seven, and both phases five and six drop from ten to five. Finally, phases seven, eight, and nine – the last few before the circle shrinks to oblivion – all drop from five spawners to three. So the monsters are still a factor, but they’re less overwhelming a threat than what we’ve seen so far. That also means you’ll still be able to see those sick zombie dance moves. With more room to manoeuvre, you might be looking for those Radar Signs and Gargoyle locations. Follow those links for guides on how to clear out all the latest challenges and get your Battle Pass yet another handful of stars.